The motto on the awning on Margiotta Hall, was a clear and direct mission statement for all the players, staff, and fans who arrived on the 2013 Fall Season opening match on August 3, 2013: “Make History Happen.” For the return to action of American soccer’s most fabled club, it was a tall challenge. 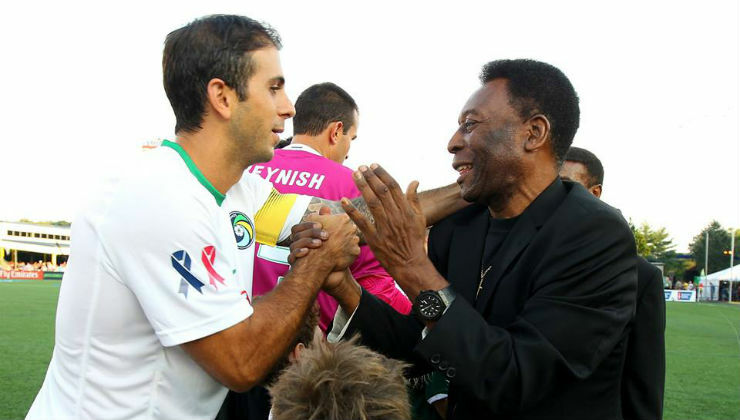 There were 11,929 fans in the stands, joined by many distinguished alumni, including Pelé and Carlos Alberto. Shuart Stadium, on the campus of Hofstra University in Hempstead, was home for the Cosmos since the club began play in 1971. 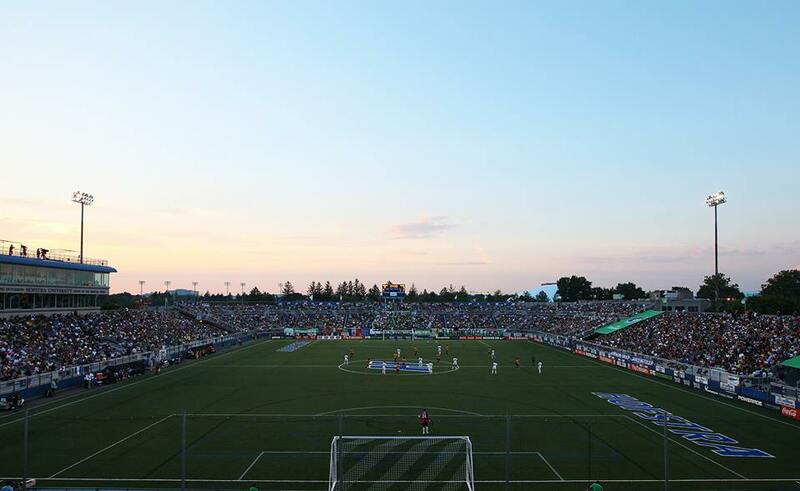 A preseason scrimmage and playoff match were played there in the Cosmos’ inaugural season, and it was home for league matches in 1972 and 1973, including the NASL Championship Final when the club won its first league title in 1972. The Cosmos trained at Hofstra until moving to the Meadowlands in 1977, so there was a historic link between the club and the venue. The opposition added to the nostalgia, the sight of the red and gold hoops of the Fort Lauderdale Strikers bringing back memories of the 19 times the clubs had played each other in the 1970s and 80s. Peruvian legend Teófilo Cubillas was present to represent Strikers alumni. Memories of Soccer Bowl 80 or the crowd of 77,691 to see the two teams battle at Giants Stadium in the 1977 playoffs were triggered. While much of the occasion was to honor the past, the true task was to build something for the future. For the first time since 1984, the New York Cosmos were competing in a North American Soccer League match, so new heroes would have to emerge to live up to the legacy. Manager Giovanni Savarese’s squad was understandably still learning to play together, and the Strikers were satisfied to spoil the home team’s efforts to play entertaining fútbol in the style of their forbears. Marcos Senna, the Brazilian-born Spanish midfielder who had won a Club World Cup with Corinthians and the Euros with the Spanish national team, tested Strikers keeper Richard Sánchez from long range, and earned a yellow card in the 36th minute. An Ayoze corner kick in the 44th minute caused chaos in the penalty area until Peri Marošević controlled the ball and calmly slotted it home for the first Cosmos goal of the reboot era. The Strikers weren’t content to play along with the feel-good script, though, and Walter Restrepo (a player who would become familiar to Cosmos fans over the next few seasons) nodded the equalizer to try and spoil the party in the 73rd minute. It seemed as though New York would have to console themselves with shared points with the Strikers until Savarese’s squad showed their Cardiac Cosmos credentials with stoppage-time theatrics. What seemed like a routine, conservative header back to Sánchez was miraculously intercepted by Alessandro Noselli, whose glancing header found the back of the net in the 93rd minute. It felt like fate. The Italian striker was a late substitute, showing Savarese’s skill in match-management. Born hours after Giorgio Chinaglia’s 7-goal playoff showcase, three-weeks before the Cosmos beat the Strikers to earn the 1980 NASL title, it was as if Noselli was destined to score this goal to send the Cosmos’ faithful into ecstasy. Referee Mark Geiger blew his whistle shortly thereafter and the sounds of Carly Simon’s “Nobody Does it Better” rang throughout Cosmos Country once again. It was a dream finish to a match that literally fulfilled the dreams of so many who longed to see the club return to competition. It was as if the soccer gods had shown their approval. The Cosmos Reboot era had kicked off in dramatic fashion. Five years on, the match has more than earned its place among the most memorable in the club’s history. Although the club will not compete this August, the magical sense of accomplishment that night in Hempstead continues to inspire those who believe the club can still make history happen.